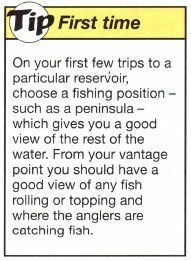 At first sight a reservoir may not seem the most exciting place to look for fish - but to the experienced angler the signs are there that point the way to large catches and big fish. Reservoirs are man-made lakes constructed either to hold supplies of drinking water or to maintain the levels of canals during dry spells in the summer. A reservoir matures slowly after it has been filled with water, gradually becoming colonized by plant and animal species. Natural stocks of coarse fish from the feeder rivers then exploit these resources. As with many other types of fishery, it is becoming increasingly common to stock carp in reservoirs; they grow quickly, fight hard and so are popular with anglers. There are two different types of reservoir: the concrete bowl and the flooded valley type. Flooded valleys are generally more scenic and pleasant to fish, though there is fishing. At first the huge open expanses of water that make up these fisheries can be daunting, but with a little thought and effort, you can find the fish and have some fabulous sport. 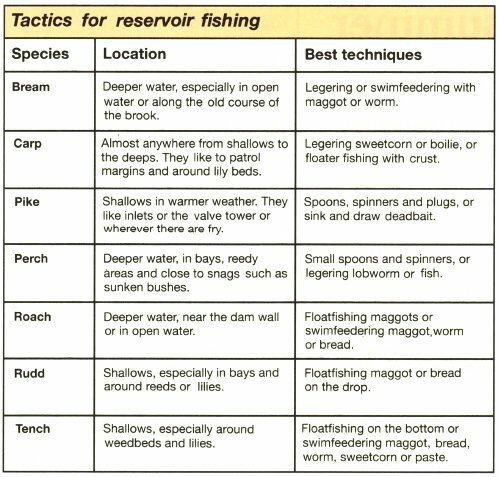 Reservoirs do not usually have many visible features, but if the following are present, they can provide clues to the location of the fish. Weedbeds, if they are present, attract all species of fish, especially tench in the shallow water at the margins and around any islands. These fish spawn in shallow weedy areas early in the season. The sport can be exceptional just after this, while they are feeding up to replace the energy and protein used up in the breeding process. Valve towers and stream inlets- usually rich sources of food, shelter and oxygenated water - attract and hold a variety of small fish and fry. The presence of so many small fish draws the predators- pike and perch. Old valley features, such as hedge rows, fences, roads, trees and the remains of buildings which became submerged when the valley was flooded to create the reservoir, also hold many fish. These are best located using an old map of the area, though sometimes asking other anglers can be fruitful. 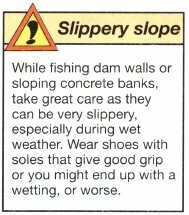 In the absence of either of these two sources of information, try working your way round the reservoir with a plummet - seeking out snaggy or uneven areas. The original course of the stream is another feature found on old maps. If it is within casting distance, it can produce big catches of the bream which -patrol along it regularly, searching for food. The dam wall is often a productive spot since you can reach deep water easily. Any food particles drifting over to it become trapped at the bottom of the wall. Fish activity - greatest at dawn and dusk is the best way to locate most species of fish. Simply walk round the water armed with binoculars, looking for fish rolling and top-ping and, in the case of the bottom feeders, bubbles and clouds of coloured water. Activity, both on the bottom and at the surface, can indicate feeding fish. Though each species of fish prefers to live in certain areas of the water (bream, roach, perch and pike often tend to choose deeper water in summer, while rudd, carp and tench seem to like the shallower areas), the weather often affects fish behaviour. The main factor to watch for is the wind. In the absence of other signs, make sure you are fishing into the breeze since most species of fish follow the prevailing wind. 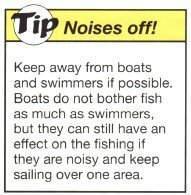 Don't make the mistake of fishing in the most sheltered and comfortable section of a water when the fish are elsewhere. When it is hot and water levels are low, most fish become lethargic during the day. This is when night fishing (where permitted) can score heavily. As the temperature falls in the evening, the fish become more active and may feed right through the night- often in the shallow margins- until the temperature starts to rise again in the morning. There are no hard and fast rules when it comes to making the most of any feeding fish you find in a reservoir. Choose tackle and tactics according to situation and the fish you're after. Reel line of around 3lb (1.4kg) is: One for most species in open water, but step this up to 4lb (1.8kg) around snags. If the fish are being coy, though, you'll need a fine hook length. The most successful methods are float fishing and using the swim feeder. If you fancy a go at summer pike, the most exciting and productive methods are often sink-and-draw dead baiting and lure fishing. They help you to cover a lot more ground than static dead baiting and so are more likely to put you in touch with fish which may only be feeding erratically. Faced with so much open water, many anglers are tempted to cast as far as they can. The fish however, often feed very close in, among the weeds and silt and can be missed by anglers fishing at great distance. This is especially true at night, when disturbances at the bankside, which tend to drive fish into the shelter of deeper water, are at a minimum. If you follow these few simple rules of thumb, a visit to an unknown reservoir need not be an excuse to blank.